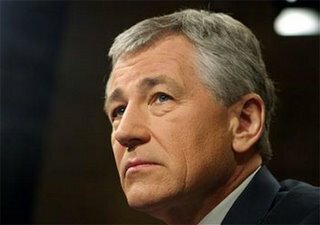 I believe Senator Chuck Hagel (R-Nebraska) is the wisest man in the republican party, and possibly in both parties. I am of course a dem, but at this stage in the game he would get my vote for the presidency in '08. I think he's the strongest, smartest leader I've seen in Washington. Wow! I'm going to keep my eye on this guy. That's an amazing, and very astute, circumspect piece he wrote. They should turn it into wallpaper for the bathroom in the Oval Office--a nice repetitive pattern so that some of what he's saying will get into Dubya's brain.